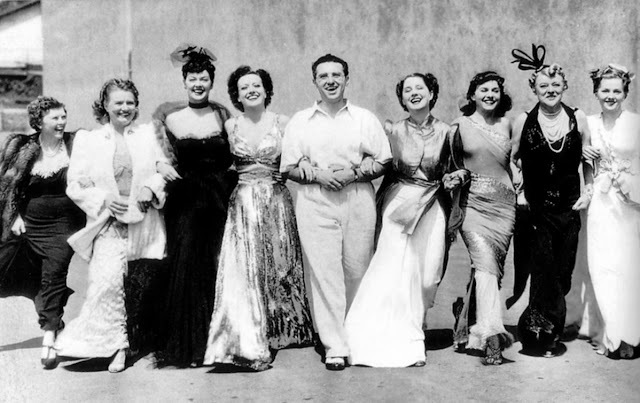 TCM is airing several films from director George Cukor this week, including The Women (the photo above shows Cukor with The Women stars Florence Nash (left); Phyllis Povah; Rosalind Russell; Joan Crawford; Norma Shearer; Paulette Goddard; Mary Boland, and Joan Fontaine). There's also two nights of films set in the American West and a double feature from living legend Kirk Douglas. Note: All times are ET and the highlighted text has links to full-length articles. Here's a link to the complete schedule for July 23-July 29. A production still from Godzilla (1954). 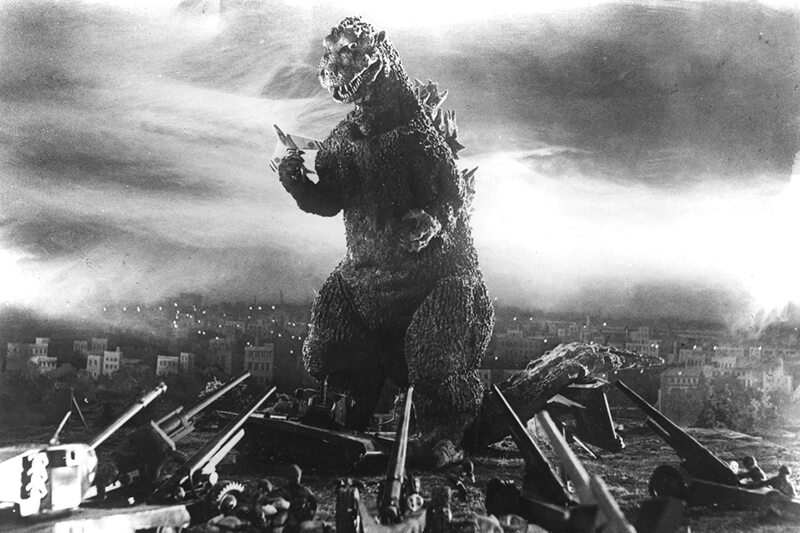 A day of fifties horror films gives viewers the chance to watch the original Japanese version of Godzilla (1954), aka Gojira, at 6 am, followed by the American version (the one with Raymond Burr) Godzilla, King of the Monsters (1956) at 7:45 am. More great scares: Karl Malden hams it up in the 3-D Edgar Allan Poe adaptation Phantom of the Rue Morgue (1954) at 11:45 am while horror legend Vincent Price gives one of his most iconic performances in the low-budget chiller, House on Haunted Hill (1958) at 5:15 pm. Also, there's Beast from Haunted Cave (1959) at 2:45 pm an interesting noir/horror mashup about a group of gangsters who hide out in a South Dakota cave that turns out to be the home of a terrifying monster. 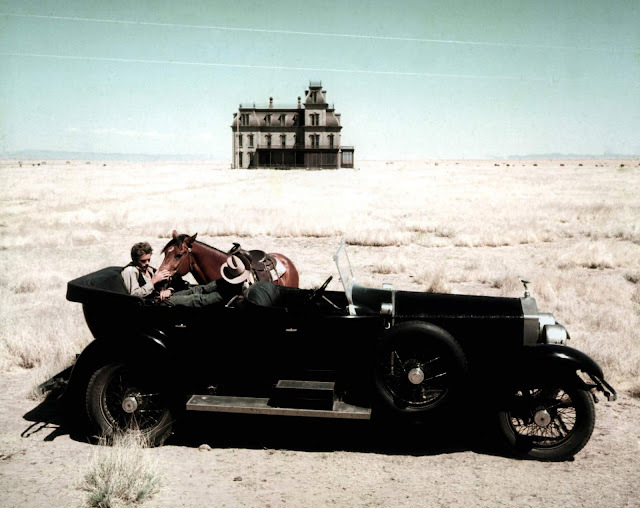 Giant (1956) at 8 pm Monday: Director George Stevens sprawling saga of one Lone Star state family was shot on location in and around Marfa, Texas. Cimarron (1960) at 11:30 pm: The second screen version of Edna Ferber's sprawling novel about the 1889 Oklahoma land rush, this movie was actually filmed in Arizona. In Cold Blood (1967) at 2:30 am: Director Richard Brooks cinema verite masterpiece (based on Truman Capote's nonfiction novel) about the murder of a rural Kansas family has chilling location shooting at the farmhouse where the killings occurred. The black-and-white cinematography by Conrad Hall, editing by Peter Zinner, and performance by Robert Blake as one of the killers are all outstanding. Boys Town (1938) at 5 am: Spencer Tracy won his second Academy Award for playing Father Flanagan, a Catholic priest who founded a home for juvenile delinquents near Omaha, Neb. 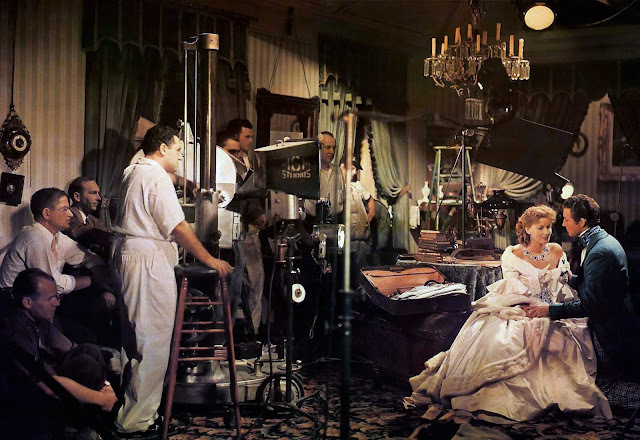 George Cukor (standing) directs Greta Garbo and Robert Taylor in Camille (1937). TCM is airing a day of thirties films from director George Cukor, who was known for his work with female stars like Katharine Hepburn and Greta Garbo and his partnership with producer David O. Selznick. Your best bets are pre-code favorite Dinner at Eight (1933) at 9:30 am Tuesday, gender-bending romance Sylvia Scarlett (1935) at 1:45 pm and tragic romance Camille (1937) at 5:45 pm. 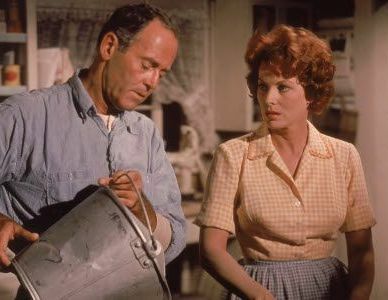 Henry Fonda and Maureen O'Hara in Spencer's Mountain (1963). Badlands (1973) at 8 pm Tuesday: Director Terence Malick's film about two South Dakota teenagers (Martin Sheen and Sissy Spacek) on a murder spree was loosely based on real events. The Purchase Price (1932) at 10 pm: Barbara Stanwyck plays a sassy nightclub singer who becomes the mail-order bride for North Dakota farmer George Brent (there's a sentence I never thought I'd write). A real pre-code charmer that zips by at 68 minutes. A River Runs Through It (1992) at 11:30 pm: This tale about two Montana brothers (Craig Sheffer and Brad Pitt) growing up during the 1920s deservedly won an Oscar for its stunning cinematography (you'll want to book a vacation after watching this film). Spencer's Mountain (1963) at 2 am: A sort-of prequel to the long-running seventies TV show The Waltons, this film follows the trials and triumphs of the oldest son (James MacArthur) of a large Wyoming clan. The film is based on a novel by The Waltons' creator Earl Hamner, Jr., but director Delmer Daves moved the location from the Blue Ridge Mountains in Virginia to the Grand Tetons to capture the magnificent scenery. The Unsinkable Molly Brown (1964) at 4:15 am: Debbie Reynolds goes from saloon singer to Colorado millionaire in this musical about a real-life Titanic survivor. Salt of the Earth (1954) at 1:30 pm Wednesday: This excellent independent film from a group of blacklisted filmmakers is about mistreated Latino miners who go on strike in New Mexico. Salt of the Earth is based on a real New Mexico miner's strike and many of the actual participants appear in the film. The result is a deeply moving and highly relevant film that deals with prejudice against Mexican-Americans and the repression of women in traditional societies. Part of a day of films about a working class. More movies about the working class: Modern Times (1936), Charlie Chaplin's classic comedy about human alienation in a mechanized world, is airing at 6:30 am. Director King Vidor documents farm life during the Great Depression in Our Daily Bread (1934) at 3:15 pm. TCM's daytime lineup of murder mysteries set in radio includes three movies starring Red Skelton as radio actor and amateur sleuth Wally "The Fox" Benton: Whistling in the Dark (1941) at 6 am, Whistling in Dixie (1942) at 7:30 am, and my favorite, Whistling in Brooklyn (1943) at 8:45 am. Especially delightful are Conrad Veidt's villainous performance in the first film and the appearance of Brooklyn Dodgers manager Leo Durocher and his team (plus Ebbets Field) in the third film. 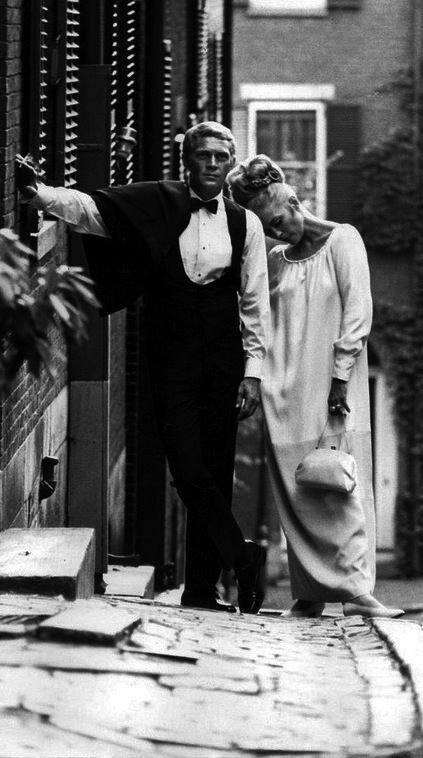 Steve McQueen and Faye Dunaway while filming The Thomas Crown Affair (1968). The Thomas Crown Affair (1968) at 8 pm Thursday: There's a lot of sixties silliness in this heist film about a millionaire (McQueen) who attempts to pull off a bank robbery, but the King of Cool is stylish perfection in the lead role. The Getaway (1972) at 10 pm: Director Sam Peckinpah, McQueen, and Ali MacGraw try to recreate film noir with somewhat mixed results. The film is still worth watching, and the supporting actors, especially Ben Johnson, are excellent. Papillon (1973) at 12:15 am: A gripping film about two men (McQueen and Dustin Hoffman) who try to escape from a notorious French prison, this movie is a quirky companion to The Great Escape. An Enemy of the People (1978) at 3 am: During the height of his fame, McQueen made this small independent film based on a play by Norwegian writer Henrik Ibsen. The Women (1939) at 5:45 pm Friday: A daytime lineup of films from pioneering screenwriter Jane Murfin brings this all-time classic co-written by Murfin and Anita Loos from Clare Booth Luce's groundbreaking play. Filled with some of the best dialogue in movie history, especially from Rosalind Russell's gossipy Sylvia and Joan Crawford's tough-as-nails Crystal. More Murfin: Murfin also co-wrote the Fred Astaire-Ginger Rogers musical Roberta (1935) at 9:30 am, The Katharine Hepburn vehicle The Little Minister (1934) at 1:30 pm, and the Greer Garson-Laurence Olivier Pride and Prejudice (1940) at 3:30 pm. Gordon Scott and Eve Brent in Tarzan's Fight for Life (1958). Highlights from this week's lineup of family films include Lord of the Jungle Gordon Scott helping a doctor (Carl Benton Reid) build a clinic in Tarzan's Fight for Life (1958), the Popeye cartoon Be Kind to 'Animals,' and every-guy Joe McDoakes (George O'Hanlon) imagining life as a private eye in So You Want to Be a Detective (1948). Airs from 8 am-noon Saturday. Kirk Douglas in Paths of Glory (1958). The Saturday night lineup features two movies from living legend Kirk Douglas starting with the anti-war film Paths of Glory (1958) at 8 pm, in which Douglas plays a military lawyer during World War I who is horrified by the senseless loss of life. Douglas has a dual role in the Australian Outback classic The Man from Snowy River (1982) at 9:45 pm. Gloria DeHaven and Van Johnson in Scene of the Crime (1949). Scene of the Crime (1949) at midnight Saturday night/Sunday morning and 10 am Sunday: Cop Van Johnson descends into the Los Angeles underworld of bookies and burlesque dancers to investigate the murder of his former partner. 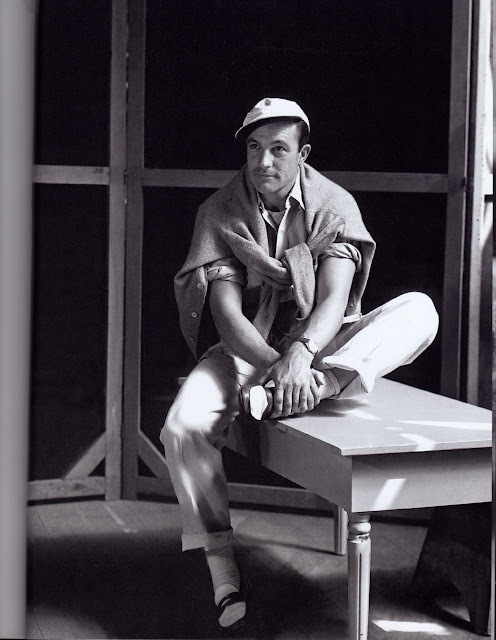 An American in Paris (1951) at 1:30 pm Sunday: Gene Kelly rests his feet between takes while making this all-time great musical. Three Coins in the Fountain (1954) at 10 pm Sunday: The ubiquitous title song (performed by Frank Sinatra) powers this Jean Negulesco-directed romance about three singletons (Dorothy McGuire, Maggie McNamara, and Jean Peters) who find love in Rome. This movie offers breathtaking location shooting in the Eternal City. 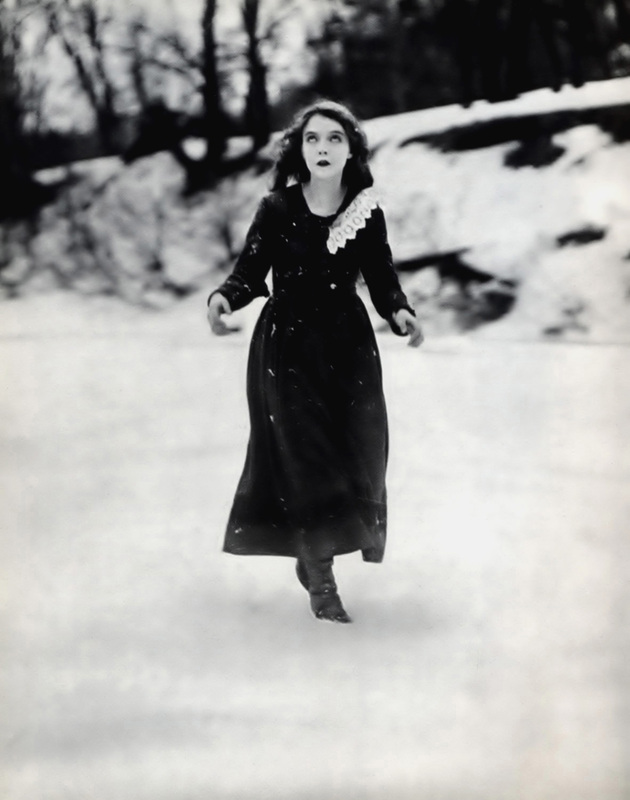 Lillian Gish in Way Down East (1920). Way Down East (1920) at midnight Sunday night/Monday morning: This creaky melodrama from director D.W. Griffith features one of Lillian Gish's great performances as an innocent country girl who is menaced by big-city baddie Lowell Sherman. Gish drifting away on an ice floe is still quite a spectacular scene. Lots going on this week. Something for every mood of every movie buff. Scene of the Crime is a definite must-see. It has an unexpected bite; at least that is how it affected me. RE: Scene of the Crime. It's interesting to me to see all those MGM actors in hard-bitten noir roles.